Greetings friends! Here are the Art-o-mat panoramas I finished in March, they should be out in machines very soon. Want to participate by hosting an Art-o-mat machine at your location or make artwork? 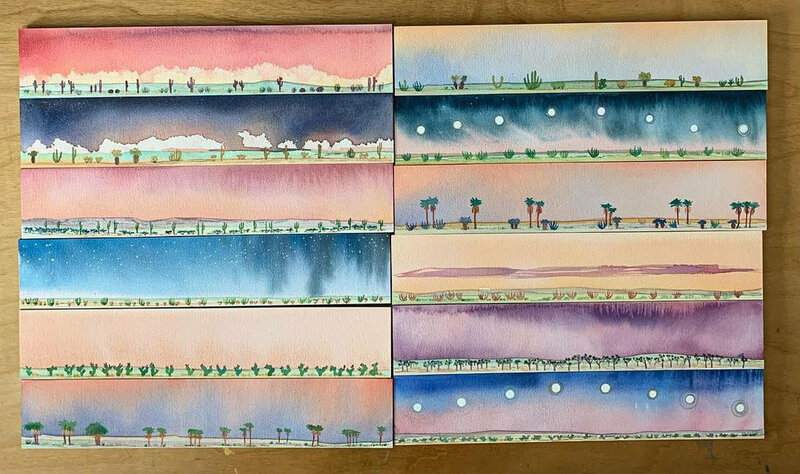 Also this month I painted a few special landscape panoramas inspired by some of my favorite landscapes in Film for the River Run International Film Festival. So much fun! Hello Artomat friends! Here are the 100 artomats coming soon to an artomat machine near you! I have listed a few of these for sale in my most recent collection. Have a suggestion for a landscape panorama collection? Leave me a comment below. I would love to hear from you! Are you interested in artomat? You can read more about my experience in my blog post. For commissions please contact me via my contact page. New Artomats were sent to HQ! Here are the sets... I have a bunch of other irons in the fire right now, but if you are interested in any of these as a full size painting let me know!